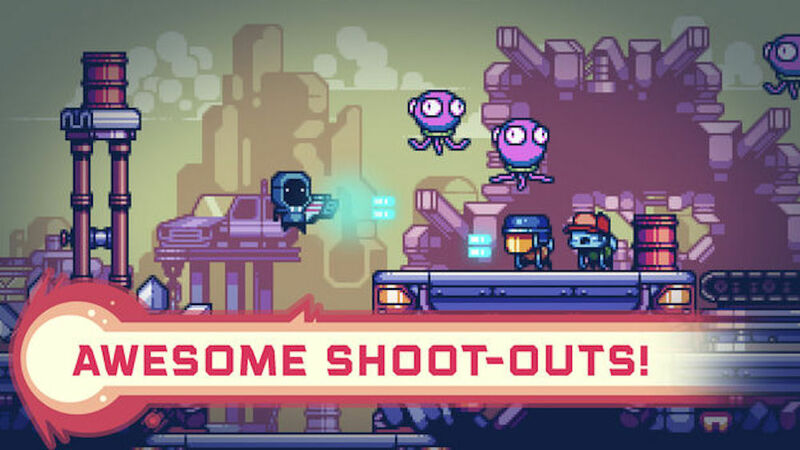 Fans of roguelites and platformers will doubtless be intrigued by Cure Hunters (Free), a challenging retro roguelite featuring a host of weapon-wielding badasses on the hunt for a cure to a virus from space. There’s just one problem: The veritable armada of alien, infected humans, and mutated wildlife that now inhabits the planet. No matter how interesting it sounds, though, Cure Hunters is a free game, which means it’s surely riddled with pay-to-win in-app purchases, ridiculous grinding, and forced ads, right? Unfortunately, while I haven’t yet encountered impossible enemies designed to force a purchase, the ridiculous amount of advertisements (the majority of which are unavoidable) is rivaled only by the amount of grinding required to unlock new characters. Simply put, while there are only three possible in-app purchases, their absence is more than made up for by the prevalence of thirty-second ads. Although their placement seems to be mostly random, it’s safe to say that there will be an ad either at the end of a level, or the start of the following. These ads cannot be skipped. In addition to these ads, there are options to watch more to double the after-game gold coins earned, immediately gain fifty gold coins, or gain extra blue coins for guns, ammo, and health packs. While these optional ads would be bothersome enough on their own, adding full-screen, unskippable ads at the end of every level is just irritating. At least they aren’t banner ads, though. The forced ads can, of course, be removed with any in-app purchase, which start at $1.99. These aren’t there to provide a sense of pride and accomplishment support the developers, and remove advertisements, of course. No, they give a varying amount of gold coins (up to eighteen thousand), the currency used to unlock new characters. While eighteen thousand coins sounds like a lot, it really isn’t—enough to purchase the two most expensive unlocks, and a little more besides. While that would take out roughly half the total grind, Cure Hunters is not relying on a wealth of content for its long-term replayability, but the desire of its players to collect all the heroes and their willingness to grind for them. This grind is just as tedious as it sounds, and it quickly turns the initial fun of blasting through levels into a time consuming slog. Looking past the ads and grind, however, the game is fun. The platforming is solid, enemies (especially those jumping frogs) are difficult, and the satisfaction of beating a zone is well worth the frustration of getting there. While each character has its own starter gun (ranging from a pistol to what I can only assume is a rocket-powered cat! ), additional armaments can be purchased between levels, as well as ammunition and health packs. These weapons can, supposedly, be upgraded as well; although I haven’t seen that option anywhere or otherwise figured out how. Completing a zone requires finding and killing all enemies. Not difficult, for the most part, although the enemy combinations can at times be troublesome. The level design itself is not particularly complex—in fact, I would almost call it down right straight-forward—although that is somewhat made up for by the variety of levels available in each zone. While there are only two levels before a boss fight, those two levels are drawn from a pool of at least five maps for each zone, so it takes a fair bit of time to see them all. Each level usually features one, sometimes more, “secret” areas with a cache of crates containing blue coins (used to purchase weapons, ammunition, and health packs during a run), ammo, or sometimes even health packs. Finding them all is almost always worthwhile, although they can be a little risky to access. It is not uncommon for there to be traps blocking the path. Fortunately, the most common variety—a block of spears—can be destroyed with a bit of effort. Alternatively, a quick dodge through does the trick. Bosses, on the other hand, are no laughing matter. They are hard, with a ton of health and a unique mechanic each. 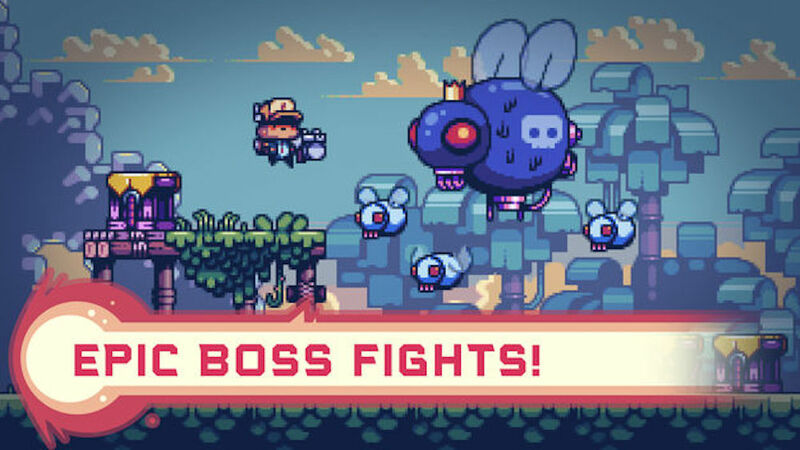 There is no randomness in how bosses are encountered, as there is when determining which levels are played—the first boss, for example, will always be an overgrown fly. They always have a set stage, and beating them with the starter gun is a tall order, though certainly not impossible. While the rest of the game is good, boss fights are definitely its strong point. When I initially downloaded Cure Hunters I expected to get a hard, fast-paced platformer with a retro feel. And that’s exactly what it is. Unfortunately, it brought along some unwanted baggage: Ads, ads, and more ads with a dash of in-app purchases. While the latter was expected, and grudgingly accepted, the former was not. Even though it’s a free game, and even though the ads can be removed with a fairly cheap in-app purchase, ads are not great experience. Especially the unskippable variety. I want to play the game I downloaded, not watch an ad for another I probably don’t care about—if I wanted to do that, I’d open YouTube. Since they are integral to the game’s monetisation strategy (and somewhat more indirectly, the progression system), though, I would be astounded if they were removed. As it stands, Cure Hunters is really a game for folks who want that retro platformer feel, or a challenging roguelite, but don’t necessarily want to pay for a ported oldie or a new game. For everyone else, the monetisation strategy will be a big red flag. Whether it’s worth downloading despite that… well, that’s up to personal preference and what you’re willing to tolerate.